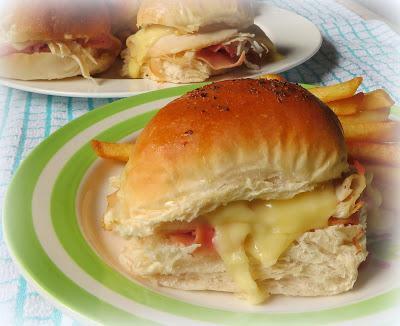 These delicious sandwiches encompass all the flavours of one of our favorite dishes Chicken Cordon Bleu. 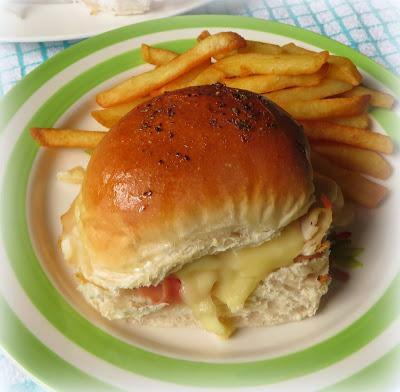 Traditionally Chicken Cordon Bleu is chicken which has been stuffed with ham and Swiss cheese, coated with crunchy bread crumbs, and then deep fried until golden brown. I make a baked version which you can find here. Its not quite as fattening as the original and requires a lot less faffing about, because as you know . . . if I can find an easier way to do something which tastes just as good as the original, I will incorporate it into my cooking. 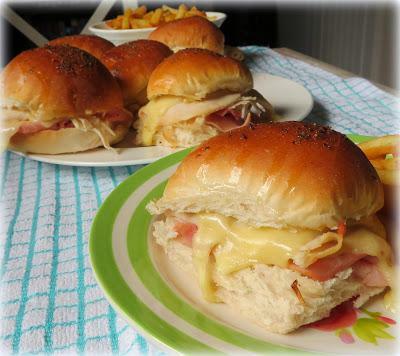 These tasty sandwiches go that little bit further in that they are even easier to make than Chicken Cordon Bleu, but just as tasty and are lot less fattening as well! 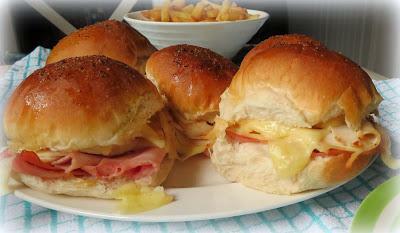 Oh I do love a tasty sandwich, burger, or slider and these are very nice. 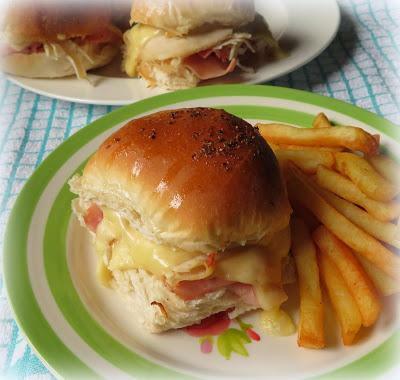 Layers of Black Forest Ham, tender roasted chicken breast (all deli meats) and Jarlsberg cheese in a toasted bun along with a fabulously tasty Honey Mustard Sauce. There is nothing complicated here. Simple. Simple. Simple. You don't need to use Jarlsberg cheese, that is just what I had in the house. Any Swiss style cheese will work well. Don't be tempted to have your deli meats cut too thinly or shaved. Shaved meats tend to fall apart. Thinly sliced does the trick beautiful. 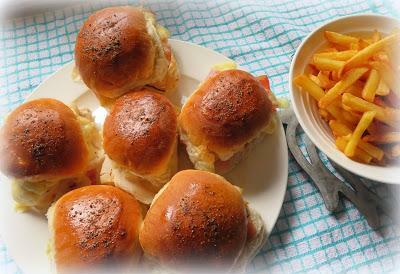 I like to layer them onto the rolls, lightly draped and folded into a little pile which covers the bread but gives a bit of height to the sandwich. Just look at those lovely layers . 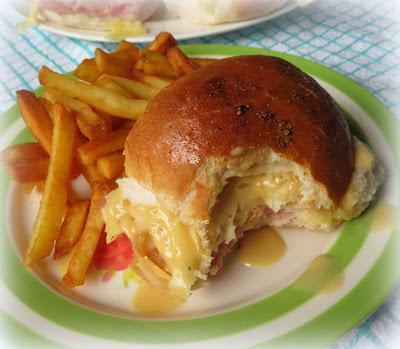 . .
One of the stars of the sandwich is the homemade Honey Mustard Sauce that I spread on the cut rolls prior to baking. I always double the recipe so that we have plenty to go around after they are baked to drizzle inside the finished rolls, but only if you want . . . I always want. This is one very tasty mouthful . . . and perfectly sized for the smaller family. You can of course double it to feed and make more. I always brush the tops of the rolls with some softened butter and sprinkle on some seasoning before popping them into the oven. I think it adds a nice finishing touch. 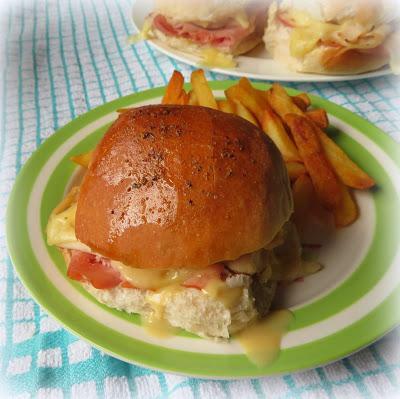 prep time: 10 minscook time: 6 minstotal time: 16 minsClassic flavours in a small batch hot sandwich that is not only delicious, but very quick and easy to make. The quantities can easily be doubled to feed more. Preheat the oven to 200*C/40)*F/ gas mark 6. Line a small baking tray with some aluminum foil and spray lightly with some cooking spray. Whisk together all of the sauce ingredients until smooth. Set aside. Slice the buns carefully in half through the middle. 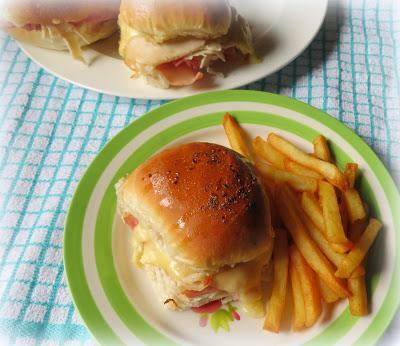 Spread about a tsp of sauce on the bottom of each bun and place them on the baking tray. Place one slice of ham on each, draped and folded to fit. 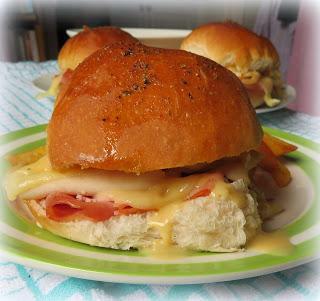 Top with 1/2 slice of cheese. Top with one slice of chicken, draped and folded. 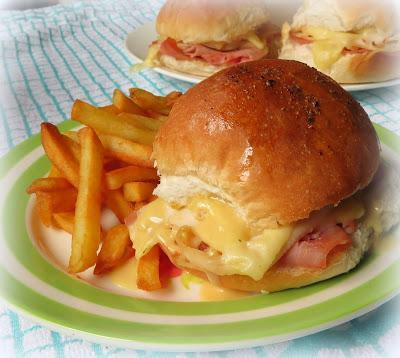 Top with the remaining 1/2 slice of cheese and then divide any remaining cheese amongst the buns. 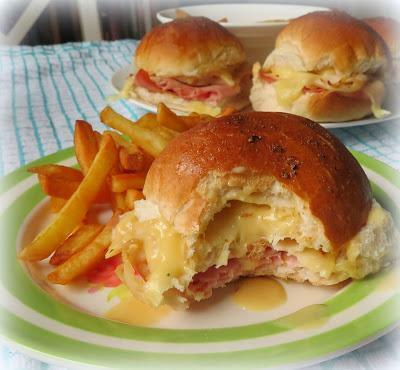 Spread the top halves of the buns on the cut sides with some more honey mustard sauce, and place on top of each filled roll. Brush the top of each with some softened butter and sprinkle with some of the herb seasoning mix. 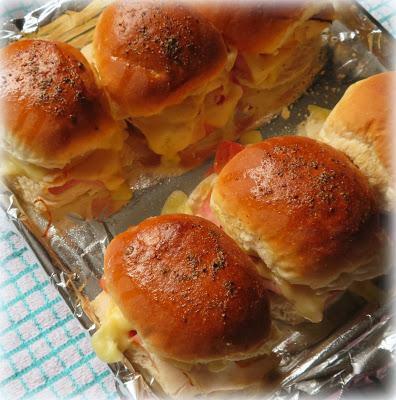 Bake in the preheated oven for 5 to 6 minutes until the cheese has melted and the sandwiches are heated through. Serve immediately along with any remaining sauce for those who wish to use it. Make sure you use thinly sliced meat as opposed to shaved meat. I also like to double the sauce so that there is plenty to go around. Quick, easy and yes, dare I say it . . . DELICIOUS! What I love about these, aside from that is their ease of preparation and lack of clean-up mess. They make a great mid-week supper. You can serve a nice salad on the side for those with a lighter appetite, or with some oven chips for those who are looking for something a bit on the heartier side. Any way, you can spell this tasty sandwich as WINNER! Enjoy!